Today I’d like to tell you how I used the military Tuition Assistance Program to pay for my Bachelor’s Degree while I was on active duty. My goal was to achieve my Bachelor’s Degree by the time I completed my first enlistment. This would give me many options going forward: I could remain in the enlisted ranks with a complimentary degree, I could apply for a commission to become an officer, or I would have my military experience and a degree, and I could try my hand in the civilian world. My goal was aggressive. By the time I started working on my degree, I had been in for about 3 and a half years on a six-year enlistment. That left me with two and a half years to complete my 4-year degree. In this podcast, I share exactly how I leveraged the Tuition Assistance program to accomplish my goal. I also discuss the military Tuition Assistance program benefits, eligibility, how to test out of college classes, and how to take classes while working a full-time military job. Tuition Assistance is one of the most valuable benefits you have available to you! Whether you plan on making the military a career, you want to go from the enlisted ranks to the officer ranks, or you want to improve your prospects in the civilian sector, formal education is an excellent investment in time and money. And if you play your cards right, you can get most, if not all, of your degree paid for by the military. 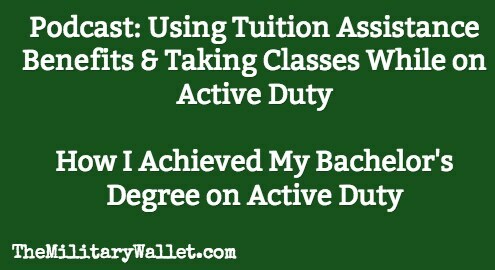 In this episode I lay it all out on the line, starting with how Tuition Assistance benefits work, how to test out of classes, and the strategies I used to complete my Bachelor’s Degree while I was on active duty. I hope you’ll find this educational and inspiring! You don’t need me to tell you that a college degree is a valuable thing to have. It can help you promote within your military career, and it can help you in your post-military career as well. You may even decide to get a degree for personal knowledge. Whatever your reason, a college degree is valuable. And getting it for free makes it an even better deal. Here is one more value play many people don’t think about: Getting your degree now gives you the option to use your GI Bill later – either for yourself for a higher level degree, or you may even be able to transfer it to a family member. Being able to transfer your GI Bill can save you or your family members tens of thousands of dollars in tuition payments. Tuition Assistance is available to most active duty military members. In general, you must have served a minimum of 181 days on active duty before you are eligible for Tuition Assistance Benefits. However, it would be rare to join the military and start taking classes 6 months later. Most branches have a minimum service requirement before members can take classes. You usually can’t use TA while you are in an official upgrade training status, either. So that means you can’t use TA while you are in basic training, or AIT, or Tech School. You generally can’t use it while you are in an official upgrade training status beyond those schools either. There may be other minimum service requirements depending on your branch of service. For example, Army policy prohibits Soldiers from taking college classes until they have completed 1 year of service after completing AIT (their tech school). They may also have to get supervisor’s approval before taking classes. When I was in the Air Force, I wasn’t allowed to begin taking college courses until I had reached my 5-level status. To put that in perspective, I had 2 months of Basic Training, followed by 6 months of tech school. Then I had about a year of upgrade training where I learned my job and received my 5-level skill certification. So it was roughly 20 months into my tour before I was even able to take college courses. I actually didn’t start for over a year after that point. But I bring that up to illustrate how long it could take before you are eligible to begin taking classes. If you aren’t eligible for Tuition Assistance benefits, it’s probably because you haven’t completed your initial training yet, or you already have a degree that is covered under Tuition Assistance (new rules often prohibit service members from using TA to achieve a lateral degree program or a lower degree than what you currently have). Each branch of the military is given an education fund by Congress. How they use it is up to them. 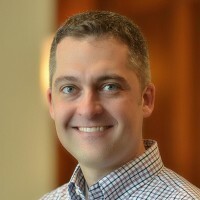 But I will tell you this benefit has come under the chopping block, and we have seen recent changes to this benefit as a direct result of budget issues (we’ll cover these later in this episode). In fact, Tuition Assistance benefits were cut from almost all branches during the sequestration. The benefit was later reinstated, but many people missed out on classes. New rules limit the benefit on many levels, including who can take classes, when they can take them, which classes they can take, and more. The Marines actually offer their benefit on a first-come, first served basis. Once they run out of funds, Tuition Assistance is done until the following year. So it makes sense to front-load classes in the hope of using your annual benefit and completing your degree more quickly without having to dip into your GI Bill or pay out of pocket expenses. All of these limits sound draconian, but they aren’t. Tuition Assistance is still an excellent benefit. In general, all branches except the Coast Guard offer 100% tuition assistance, up to a set dollar amount per credit hour – usually $250 per credit hour. The total amount one can receive in any given year or over their lifetime is determined by each branch. The exception is the Coast Guard, which currently offers 75% TA, up to $187.50 per credit hour, for a total of $2,250 per year. Tuition Assistance can be used for approved college courses, certain exams (such as the GRE, GMAT, SAT, ACT, etc. ), and for some professional certifications. Not all professional certifications are covered, there may be limitations on which programs you can use TA for, and limits on when you can use TA for a certification. For example, you may have a lifetime cap on the benefits you can receive for a professional certification. Or you may have an annual Tuition Assistance benefits cap that applies to both certifications and college courses. You will need to contact your education office for more specific information on what you can use TA for. Also, the DoD no longer allows the Tuition Assistance programs to cover lab fees or certain course fees. A new DoD Instruction requires servicemembers to repay their branch of service if they fail to maintain satisfactory scores on the coursework. For example, you may be required to repay the cost of your classes if you earn a D or lower in an undergrad course, or a C or lower in a graduate level course. Maintain good grades. The military retains the right to suspend your TA benefits if you don’t maintain high enough scores. You would then have to pay for classes out of pocket or use the GI Bill to bring your GPA up to acceptable levels before you would be eligible to receive TA benefits again. Another related benefit related to Tuition Assistance is college placement exams. These are tests you can take to test out of college classes and the cost is covered under the Tuition Assitance program. They can be a huge time- and money-saver! Some examples of placement exams that you can take through the military include CLEP tests, or the College Level Examination Program, and DANTES Exams. DANTES is a DoD program, that stands for Defense Activity for Non-Traditional Education Support. When I received my degree there was another program called Excelsior exams. The program is still around, but the exams are no longer free for military members. They can still be worth taking if it saves you from taking the actual college course. Just be sure to look at the CLEP and DANTES options first. The tests work like this: you visit your Education and Training Office, sign up to take a test, and if you pass, you can receive college for the course. A couple of notes – these aren’t accepted by every college, but they are accepted by most community colleges and state schools, and by many private universities. They are also accepted by the Community College of the Air Force, which makes them popular for Airmen who want to receive their Associate’s Degree from the Air Force. Before taking these exams, you want to make sure they are accepted by your school, and that they will work toward your degree plan. Some schools won’t allow you to test out of classes that are directly related to your major or minor. And some schools may only accept these test for elective credits. Other schools may have a limit to the number of credit hours you can transfer in, and another limit for how many classes you can test out of. I’ll share how I used these test toward my degree in just a few moments. Most people study for placement exams the wrong way. They go to the base library and borrow a study guide, which is usually just a few practice tests. They try to memorize as many questions as they can, then they take the test. It’s no surprise many people fail. You don’t learn anything from studying questions. You need to learn the material. The practice tests aren’t bad. Just don’t use the test alone and expect to pass. Each of these companies has an associated website. You can visit the site, search for the test you want to take, and look at the test information. The companies show the test name and how the test questions are broken up. For example, if you wanted to take a US History I test, it would give the breakdown as US History, 1500 – 1877. Here is the site. 70% covers the dates after the Revolutionary War through the end of the Civil War and into the Reformation. There are further breakdowns on the page that list percentages of what the test covers, 35% covers political institutions and public policy, 25% covers this, 15% covers that, etc. The page also lists 20 or so themes you need to know to pass the test. Use this information as your study guide. Print out that screen, grab a spiral notebook, and spend a couple hours on Google and Wikipedia learning all the information on the study guide you just downloaded for free. Once you have a handle on the information, you can spend some time with the practice tests. Just don’t expect to pass the test with the practice tests alone. It probably won’t work well. What Happens if you fail a placement test? The tests are free for active duty members, but if you fail you have to wait a few months before you can take the class again, and you may have to pay to take it. So be sure to know the material before you sit for the test! Here are more tips for testing out of college classes. Now I’d like to tell you my story – how I used Tuition Assistance benefits to complete my Bachelor’s degree while I was on active duty. I had been in the Air Force for 3 and a half years, which was just past my halfway point on my 6-year enlistment. I decided I wanted to complete my Bachelor’s Degree before my 6-year mark so I had options when it came time to decide whether or not to re-up. Getting my degree was a great strategic move as it gave me the option of staying in the military as an enlisted member, the option of applying for a Commission as an Officer, or getting out of the service with my experience and a Bachelor’s Degree. I had already completed one year of college when I joined the military, so at most, I was looking at taking 3 years of college to complete my 4-year degree. I knew about College Placement Exams, so I figured I had enough time to complete my degree if I got lucky and passed a few tests. It actually took me just over a year and a half to complete my degree, and that included a PCS and two 4-month deployments. The first thing I did was visit the base education office to see my options. There were a couple colleges there, and I spoke with the representative from Embry-Riddle Aeronautical University. They have an excellent program, and they have satellite campuses on many military installations. I made an appointment with a counselor to get a degree plan made, and found out that a lot of my Air Force training would count as college credits toward either a technical management degree or a degree in Professional Aeronautics, which is basically a management degree with a heavy emphasis on the aviation field. Between my year of college and my military training, I had almost two years of credits on the books (the Air Force has the Community College of the Air Force, which is an accredited community college). I also received college credits for professional military education, which was required when I became an NCO. With my credits, I needed to take just over 2 years worth of classes to receive my Bachelor’s Degree. The counselor was kind enough to show me exactly which classes I could test out of, and we made a list of the classes I would need to take to get my degree. Armed with this knowledge, I scheduled some CLEP tests and studied them using the method I outlined earlier. I passed all of them. As for the required courses through Embry-Riddle, I completed those through a combination of in-residence classes and distance learning while I was deployed. Embry-Riddle had a satellite campus on our base, which only offered night classes. I was single, and education was a priority for me, so I volunteered to work the midnight shift for almost two years while I worked toward my degree. I went to class from 5 – 9 pm, had dinner, then went to work around midnight. I went to bed when I got home, then studied and wrote papers in the afternoon before going to class again. I worked with my supervisors to ensure I could remain on the midnight shift. They loved that because they had an NCO on the late-shift, and I loved it because it allowed me to take classes. I also took online classes when I was deployed. We often worked 14 hour days while deployed, but there was always some downtime here and there. I was an aircraft mechanic, and we had to ride the launch truck in case there were any last-minute emergencies. Riding launch could take anywhere from 15 minutes, to well over an hour. Much of that time we were on standby. While everyone on the truck was cutting up or reading Maxim Magazine, I was reading about the history of flight or a book about aviation management. I also used my random days off to study and write papers. Using a combination of my previous college credits, my Air Force training, taking placement exams, and taking classes through Embry-Riddle, I was able to complete my degree in about 20 months. It would have taken longer if I didn’t have the year of college already under my belt, but I also would have doubled-up on more classes and tested out of other classes. I’m confident I could have completed it in around 2, to 2.5 years. My situation was unique because I already had a year of college and I received a lot of credits for my Air Force Training. Your situation will be your own. So you need to be strategic with your planning. I chose the degree that was best for me at the time. I had hopes of being an Air Force officer, so a degree in Professional Aeronautics was a great fit. It worked well with my experience and gave me options going forward. It was also the easiest for me to achieve because of the credits I received for my Air Force training. You may or may not be in a situation where you can apply your military training toward your degree, but you should at least look into it. You should also look into testing out of classes. They will save you a lot of time, money, and heartache. Sit down with your guidance counselor and determine which classes you must take, and which you can test out of. It’s reasonable to test out of one or two classes per month if you keep to a schedule. Here are more tips for taking classes while on active duty. Finally, you need to maintain your work standards and be flexible with your work situation. Most units require a supervisor’s permission to take classes. They aren’t likely to give you permission if you are still in upgrade training or your work isn’t up to par. You also won’t be able to take classes if you have an unfavorable information file. So make sure you pass your PT tests, show up to work on time, and maintain the expected performance. As to your work schedule, you may need to get creative. The classes offered on our base were in the evenings. So I offered to work the midnight shift in order to take classes. Things can get tricky if your only option is the day shift and your school only offers classes in the daytime. If that is the case, you may need to get creative with scheduling and offer to work an extra hour here or there, eat a 10-minute lunch every day, or take classes online. You might even consider attending classes at a different school. But don’t let those little details stop you from taking classes. Tuition Assistance is a very valuable benefit and achieving your degree can pay dividends long after your military career ends. Great advice honestly, I just finished the initial swear in for the the Air force I plan on doing 6 years and i’m looking into getting my Bachelors in Criminal justice. I wasn’t sure how it all worked but your article did shine a lot of light to my issue. If you could email me to just ask a bit more questions that be great appreciated. Good thorough article, but there are a few minor inaccuracies. One thing that is missed here which really helps is IDT Travel. The USAR (not sure about the NG) will pay up to $300 in travel expenses to attend Battle Assembly (drill). It follows the usual rules and must be filed through DTS. Between that and Lodging-in-Kind, the majority of Service Members should have no costs for attending weekend duty.